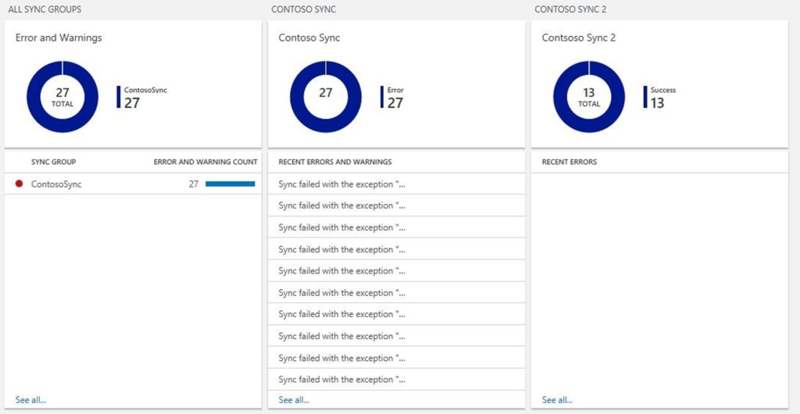 To check the SQL Data Sync activity log and detect errors and warnings, you previously had to check SQL Data Sync manually in the Azure portal, or use PowerShell or the REST API. Follow the steps in this article to configure a custom solution that improves the Data Sync monitoring experience. You can customize this solution to fit your scenario. You no longer need to look through the logs of each Sync Group individually to look for issues. You can monitor all your Sync Groups from any of your subscriptions in one place by using a custom Azure Monitor view. This view surfaces the information that matters to SQL Data Sync customers. You no longer need to check the log manually in the Azure portal or through PowerShell or the REST API. With Azure Monitor logs, you can create alerts that go directly to the email addresses of the people that need to see them when an error occurs. How do you set up these monitoring features? A PowerShell runbook to feed SQL Data Sync log data to Azure Monitor logs. An Azure Monitor alert for email notifications. An Azure Monitor View for monitoring. Use a PowerShell runbook hosted in Azure Automation to pull the SQL Data Sync log data and send it to Azure Monitor logs. A sample script is included. As a prerequisite, you need to have an Azure Automation account. Then you need to create a runbook and schedule it to run. For more info about creating a runbook, see My first PowerShell runbook. Under your Azure Automation account, select the Runbooks tab under Process Automation. Select Add a Runbook at the top left corner of the Runbooks page. Select Import an existing Runbook. Under Runbook file, use the given DataSyncLogPowerShellRunbook file. Set the Runbook type as PowerShell. Give the runbook a name. Select Create. You now have a runbook. Under your Azure Automation Account, select the Variables tab under Shared Resources. Select Add a variable on the Variables page. Create a variable to store the last execution time for the runbook. If you have multiple runbooks, you need one variable for each runbook. Set the variable name as DataSyncLogLastUpdatedTime and set its Type as DateTime. Select the runbook and click the edit button at the top of the page. Azure Monitor logs information. Find this information in Azure Portal | Settings | Connected Sources. For more information about sending data to Azure Monitor logs, see Send data to Azure Monitor logs with the HTTP Data Collector API (preview). Run the runbook in the Test pane. Check to make sure it was successful. If you have errors, make sure you have the latest PowerShell module installed. You can install the latest PowerShell module in the Modules Gallery in your Automation Account. Under the runbook, select the Schedules tab under Resources. Select Add a Schedule on the Schedules page. Set Recurrence to Recurring and set the interval you want. Use the same interval here, in the script, and in Azure Monitor logs. To monitor whether your automation is running as expected, under Overview for your automation account, find the Job Statistics view under Monitoring. Pin this view to your dashboard for easy viewing. Successful runs of the runbook show as "Completed" and Failed runs show as "Failed." To create an alert that uses Azure Monitor logs, do the following things. As a prerequisite, you need to have Azure Monitor logs linked with a Log Analytics workspace. In the Azure portal, select Log Search. After running the query, select the bell that says Alert. Under Generate alert based on, select Metric Measurement. After Greater than, enter the threshold to elapse before you receive notifications. Transient errors are expected in Data Sync. To reduce noise, set the threshold to 5. Under Actions, set Email notification to "Yes." Enter the desired email recipients. Click Save. The specified recipients now receive email notifications when errors occur. An overview tile, which shows how many errors, successes, and warnings all the sync groups have. A tile for all sync groups, which shows the count of errors and warnings per sync group. Groups with no issues don't appear on this tile. A tile for each Sync Group, which shows the number of errors, successes, and warnings, and the recent error messages. On the Log Analytics workspace home page, select the plus on the left to open the view designer. Select Import on the top bar of the view designer. Then select the "DataSyncLogOMSView" sample file. Create new "Donut & List" objects from the Gallery as needed. In each tile, update the queries with your information. On each tile, change the TimeStamp_t interval as desired. On the tiles for each Sync Group, update the Sync Group names. On each tile, update the title as needed. Click Save and the view is ready. In most cases, this solution is free. Azure Automation: There may be a cost incurred with the Azure Automation account, depending on your usage. The first 500 minutes of job run time per month are free. In most cases, this solution is expected to use less than 500 minutes per month. To avoid charges, schedule the runbook to run at an interval of two hours or more. For more info, see Automation pricing. Azure Monitor logs: There may be a cost associated with Azure Monitor logs depending on your usage. The free tier includes 500 MB of ingested data per day. In most cases, this solution is expected to ingest less than 500 MB per day. To decrease the usage, use the failure-only filtering included in the runbook. If you are using more than 500 MB per day, upgrade to the paid tier to avoid the risk of analytics stopping when the limitation is reached. For more info, see Azure Monitor logs pricing.